Ural–Altaic, Uralo-Altaic or Uraltaic is a linguistic convergence zone and former language-family proposal uniting the Uralic and the Altaic (in the narrow sense) languages. It is generally now agreed that even the Altaic languages most likely do not share a common descent: the similarities among Turkic, Mongolic and Tungusic are better explained by diffusion and borrowing. Cecelia Eaton Luschnig, an expert of Ancient Greek language, has written that "this term and the kinship it implies is now considered obsolete" as a family proposal. However, the term continues to be used for the central Eurasian typological, grammatical and lexical convergence zone. Indeed, "Ural-Altaic" may be preferable to "Altaic" in this sense. For example, J. Janhunen states that "speaking of 'Altaic' instead of 'Ural-Altaic' is a misconception, for there are no areal or typological features that are specific to 'Altaic' without Uralic." Originally suggested in the 18th century, the genealogical and racial hypotheses remained debated into the mid-20th century, often with disagreements exacerbated by pan-nationalist agendas. It had many proponents in Britain. Since the 1960s, the proposed language family has been widely rejected. A relationship between the Altaic, Indo-European and Uralic families was revived in the context of the Nostratic hypothesis, which was popular for a time, with for example Allan Bomhard treating Uralic, Altaic and Indo-European as coordinate branches. However, Nostratic too is now mostly rejected. The concept of a Ural-Altaic ethnic and language family goes back to the linguistic theories of Gottfried Wilhelm Leibniz; in his opinion there was no better method for specifying the relationship and origin of the various peoples of the Earth, than the comparison of their languages. In his 'Brevis designatio meditationum de originibus gentium ductis potissimum ex indicio linguarum', written in 1710, he originates every human language from one common ancestor language. Over time, this ancestor language split into two families; the Japhetic and the Aramaic. The Japhetic family split even further, into Scythian and Celtic branches. The members of the Scythian family were: the Greek language, the family of Sarmato-Slavic languages (Russian, Polish, Czech, Dalmatian, Bulgar, Slovene, Avar and Khazar), the family of Turkic languages (Turkish, Cuman, Kalmyk and Mongolian), the family of Finnic languages (Finnish, Saami, Hungarian, Estonian, Liv and Samoyed). Although his theory and grouping were far from perfect, they had a considerable effect on the development of linguistic research, especially in German-speaking countries. Danish philologist Rasmus Christian Rask described what he called "Scythian" languages in 1834, which included Finno-Ugric, Turkic, Samoyedic, Eskimo, Caucasian, Basque and others. The hypothesis[clarification needed] was elaborated at least as early as 1836 by W. Schott and in 1838 by F. J. Wiedemann. The "Altaic" hypothesis, as mentioned by Finnish linguist and explorer Matthias Castrén by 1844, included the Finno-Ugric and Samoyedic, collectively called as "Chudic", and Turkic, Mongolic, and Tungusic, collectively called as "Tataric". 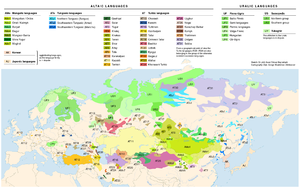 Subsequently, in the latter half of the 19th century Turkic, Mongolic, and Tungusic came to be referred to as Altaic languages, whereas Finno-Ugric and Samoyedic were called Uralic. The similarities between these two families led to their retention in a common grouping, named Ural–Altaic. Friedrich Max Müller, the German Orientalist and philologist, published and proposed a new grouping of the non-Aryan and non-Semitic Asian languages in 1855. In his work The Languages of the Seat of War in the East he called these languages "Turanian". Müller divided this group into two subgroups, the Southern Division, and the Northern Division. In the long run, his evolutionist theory about languages' structural development, tying growing grammatical refinement to socio-economic development, and grouping languages into 'antediluvian', 'familial', 'nomadic', and 'political' developmental stages, proved unsound, but his Northern Division was renamed and re-classed as the "Ural-Altaic languages". Between the 1850s and 1870s, there were efforts by Frederick Roehrig to including some Native American languages in a "Turanian" or "Ural-Altaic" family, and between the 1870s and 1890s speculations about links with Basque. In Hungary the idea of the Ural–Altaic relationship remained widely implicitly accepted in the late 19th and the mid-20th century, though more out of pan-nationalist than linguistic reasons, and without much detailed research carried out. [clarification needed] Elsewhere the notion had sooner fallen into discredit, with Ural–Altaic supporters elsewhere such as the Finnish Altaicist Martti Räsänen being in the minority. The contradiction between Hungarian linguists' convictions and the lack of clear evidence eventually provided motivation for scholars such as Aurélien Sauvageot and Denis Sinor to carry out more detailed investigation of the hypothesis, which so far has failed to yield generally accepted results. Nicholas Poppe in his article The Uralo-Altaic Theory in the Light of the Soviet Linguistics (1940) also attempted to refute Castrén's views by showing that the common agglutinating features may have arisen independently. Beginning in the 1960s, the hypothesis came to be seen even more controversial, due to the Altaic family itself also falling out universal acceptance. Today, the hypothesis that Uralic and Altaic are related more closely to one another than to any other family has almost no adherents. There are, however, a number of hypotheses that propose a macrofamily including Uralic, Altaic and other families. None of these hypotheses has widespread support. In his Altaic Etymological Dictionary, co-authored with Anna V. Dybo and Oleg A. Mudrak, Sergei Starostin characterized the Ural–Altaic hypothesis as "an idea now completely discarded". In Starostin's sketch of a "Borean" super-phylum, he puts Uralic and Altaic as daughters of an ancestral language of c. 9,000 years ago from which the Dravidian languages and the Paleo-Siberian languages, including Eskimo-Aleut, are also descended. He posits that this ancestral language, together with Indo-European and Kartvelian, descends from a "Eurasiatic" protolanguage some 12,000 years ago, which in turn would be descended from a "Borean" protolanguage via Nostratic. Angela Marcantonio (2002) argues that there is no sufficient evidence for a Finno-Ugric or Uralic group connecting the Finno-Permic and Ugric languages, and suggests that they are no more closely related to each other than either is to Turkic, thereby positing a grouping very similar to Ural–Altaic or indeed to Castrén's original Altaic proposal. This thesis has been criticized by mainstream Uralic scholars. Linguist Martine Robbeets exemplify that "The Ural-Altaic theory was rather widely accepted in the 19th century, but after the affinity of the Uralic languages was established, the Ural-Altaic theory lost many of its supporters. Although it is commonplace in contemporary linguistic literature to reject the Ural-Altaic theory as such, the debate on possible genetic links between well established families is more animated than ever before. It is in this light that attempts to establish Nostratic or Eurasianic can be seen." According to the linguist Juha Janhunen typological parallels among Uralic and Altaic languages are accompanied by areal adjacency, calling it "a distinct Ural-Altaic language area and language type" belonging to a "single trans-Eurasian belt of agglutinative languages" in which Turkic, Mongolic, Tungusic, Korean, and Japanese are included. having a separate verb for existential clause which is different from ordinary possession verbs like "to have"
Such similarities do not constitute sufficient evidence of genetic relationship all on their own, as other explanations are possible. Juha Janhunen has argued that although Ural–Altaic is to be rejected as a genealogical relationship, it remains a viable concept as a well-defined language area, which in his view has formed through the historical interaction and convergence of four core language families (Uralic, Turkic, Mongolic and Tungusic), and their influence on the more marginal Korean and Japonic. Contrasting views on the typological situation have been presented by other researchers. Michael Fortescue has connected Uralic instead as a part of an Uralo-Siberian typological area (comprising Uralic, Yukaghir, Chukotko-Kamchatkan and Eskimo-Aleut), contrasting with a more narrowly defined Altaic typological area; while Anderson has outlined a specifically Siberian language area, including within Uralic only the Ob-Ugric and Samoyedic groups; within Altaic most of the Tungusic family as well as Siberian Turkic and Buryat (Mongolic); as well as Yukaghir, Chukotko-Kamchatkan, Eskimo-Aleut, Nivkh, and Yeniseian. The Altaic language family was generally accepted by linguists from the late 19th century up to the 1960s, but since then has been in dispute. For simplicity's sake, the following discussion assumes the validity of the Altaic language family. Two senses should be distinguished in which Uralic and Altaic might be related. Do Uralic and Altaic have a demonstrable genetic relationship? If they do have a demonstrable genetic relationship, do they form a valid linguistic taxon? For example, Germanic and Iranian have a genetic relationship via Proto-Indo-European, but they do not form a valid taxon within the Indo-European language family, whereas in contrast Iranian and Indo-Aryan do via Indo-Iranian, a daughter language of Proto-Indo-European that subsequently calved into Indo-Aryan and Iranian. In other words, showing a genetic relationship does not suffice to establish a language family, such as the proposed Ural–Altaic family; it is also necessary to consider whether other languages from outside the proposed family might not be at least as closely related to the languages in that family as the latter are to each other. This distinction is often overlooked but is fundamental to the genetic classification of languages. Some linguists indeed maintain that Uralic and Altaic are related through a larger family, such as Eurasiatic or Nostratic, within which Uralic and Altaic are no more closely related to each other than either is to any other member of the proposed family, for instance than Uralic or Altaic is to Indo-European (for example Greenberg). To demonstrate the existence of a language family, it is necessary to find cognate words that trace back to a common proto-language. Shared vocabulary alone does not show a relationship, as it may be loaned from one language to another or through the language of a third party. There are shared words between, for example, Turkic and Ugric languages, or Tungusic and Samoyedic languages, which are explainable by borrowing. However, it has been difficult to find Ural–Altaic words shared across all involved language families. Such words should be found in all branches of the Uralic and Altaic trees and should follow regular sound changes from the proto-language to known modern languages, and regular sound changes from Proto-Ural–Altaic to give Proto-Uralic and Proto-Altaic words should be found to demonstrate the existence of a Ural–Altaic vocabulary. Instead, candidates for Ural–Altaic cognate sets can typically be supported by only one of the Altaic subfamilies. In contrast, about 200 Proto-Uralic word roots are known and universally accepted, and for the proto-languages of the Altaic subfamilies and the larger main groups of Uralic, on the order of 1000–2000 words can be recovered. Some[who?] linguists point out strong similarities in the personal pronouns of Uralic and Altaic languages. The basic numerals, unlike those among the Indo-European languages (compare Proto-Indo-European numerals), are particularly divergent between all three core Altaic families and Uralic, and to a lesser extent even within Uralic. that the voiced spirant ɣ- in Mongolian can correspond to the voiceless stop *k- in Finno-Ugric (known to be the source of Hungarian h-). ^ According to Manaster Ramer & Sidwell, this misconception first dates back to a 1901 article by Otto Donner, later most prominently repeated by Nicholas Poppe, Merritt Ruhlen and G. D. Sanzheev. ^ "...[T]his selection of features does not provide good evidence for common descent" and "we can observe convergence rather than divergence between Turkic and Mongolic languages—a pattern than is easily explainable by borrowing and diffusion rather than common descent", Asya Pereltsvaig, Languages of the World, An Introduction (2012, Cambridge) has a good discussion of the Altaic hypothesis (pp. 211-216). ^ Cecelia Eaton Luschnig; Lance J. Luschnig (2017). ETYMA Two: An Introduction to Vocabulary Building from Latin and Greek. Rowman & Littlefield. p. 8. ISBN 9780761868941. ^ BROWN, Keith and OGILVIE, Sarah eds. :Concise Encyclopedia of Languages of the World. 2009. p. 722. ^ a b Stefan Georg (2017) "The Role of Paradigmatic Morphology in Historical, Areal and Genealogical Linguistics: Thoughts and Observations in the Margin of Paradigm Change in The Transeurasian languages and Beyond (Robbeets and Bisang, eds.)." Journal of Language Contact, volume 10, issue 2, p.
^ Sinor 1988, p. 710. ^ Ramer, Alexis Manaster; Sidwell, Paul (1997). "The truth about Strahlenberg's classification of the languages of Northeastern Eurasia". Journal de la Société Finno-Ougrienne. 87: 139–160. ^ F. J. Wiedemann, Ueber die früheren Sitze der tschudischen Völker und ihre Sprachverwandschaft mit dem Völkern Mittelhochasiens (1838). ^ Sinor 1988, pp. 707–708. ^ Sergei Starostin. "Borean tree diagram". ^ In: ROBBEETS, Martine Irma: Is Japanese Related to Korean, Tungusic, Mongolic and Turkic? 2005. p. 18-19. ^ Proto-Uralic—what, where, and when? Juha JANHUNEN (Helsinki) The Quasquicentennial of the Finno-Ugrian Society. Suomalais-Ugrilaisen Seuran Toimituksia = Mémoires de la Société Finno-Ougrienne 258. Helsinki 2009. 61–62. ^ Sinor 1988, pp. 711–714. ^ Janhunen, Juha (2007). "Typological Expansion in the Ural-Altaic belt". Incontri Linguistici: 71–83. ^ Fortescue, Michael (1998). Language Relations across Bering Strait: Reappraising the Archaeological and Linguistic Evidence. London and New York: Cassell. ISBN 0-304-70330-3. ^ Anderson, Gregory D. S. (2006). "Towards a typology of the Siberian linguistic area". In Matras, Y.; McMahon, A.; Vincent, N. (eds.). Linguistic Areas. Convergence in Historical and Typological Perspective. Palgrave Macmillan. pp. 266–300. ^ Sinor 1988, p. 736. ^ Sinor 1988, pp. 710–711. ^ Róna-Tas, A. (1983). "De hypothesi Uralo-Altaica". Symposium saeculare societatis Fenno-Ugricae. Memoires de la Société Finno-Ougrienne. 185. pp. 235–251. ^ Poppe, Nicholas (1983). "The Ural-Altaic affinity". Symposium saeculare societatis Fenno-Ugricae. Memoires de la Société Finno-Ougrienne. 185. pp. 189–199. Greenberg, Joseph H. (2000). Indo-European and Its Closest Relatives: The Eurasiatic Language Family, Volume 1: Grammar. Stanford: Stanford University Press. Greenberg, Joseph H. (2005). Genetic Linguistics: Essays on Theory and Method, edited by William Croft. Oxford: Oxford University Press. Marcantonio, Angela (2002). The Uralic Language Family: Facts, Myths and Statistics. Publications of the Philological Society. 35. Oxford – Boston: Blackwell. Shirokogoroff, S. M. (1931). Ethnological and Linguistical Aspects of the Ural–Altaic Hypothesis. Peiping, China: The Commercial Press. Sinor, Denis (1988). "The Problem of the Ural-Altaic relationship". In Sinor, Denis (ed.). The Uralic Languages: Description, History and Modern Influences. Leiden: Brill. pp. 706–741. Starostin, Sergei A., Anna V. Dybo, and Oleg A. Mudrak. (2003). Etymological Dictionary of the Altaic Languages. Brill Academic Publishers. ISBN 90-04-13153-1. Vago, R. M. (1972). Abstract Vowel Harmony Systems in Uralic and Altaic Languages. Bloomington: Indiana University Linguistics Club. Keane, Augustus Henry (1911). "Ural-Altaic". Encyclopædia Britannica. 27 (11th ed.). pp. 784–6. This reflects the contemporary transitional state of understanding of the relationships among the languages. Whitney, William Dwight; Rhyn, G. A. F. Van (1879). "Turanian Race and Languages" . The American Cyclopædia.